More than half of the world’s population lives in an urban area. According to the United Nations’ World Cities Report 2016, three-quarters of cities have higher levels of income inequalities than 20 years ago; there are growing populations, slums and insecure settlements; more people than ever are having to migrate involuntarily; and many cities are facing threats associated with the environment and climate change. Could the design of our cities combat some of these challenges, and embrace the changes technology will bring? 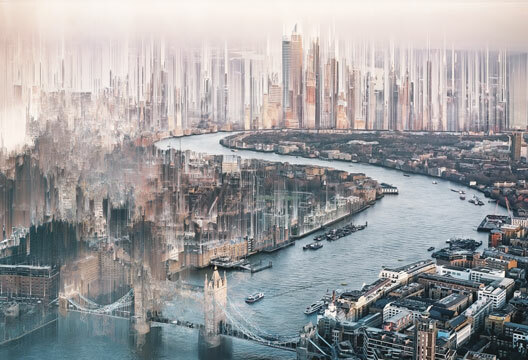 Is psychology well placed to form the foundation of the cities of the future? Cities can sometimes feel like the world in microcosm… beyond the wide-open spaces of rural areas, the everyday interactions and experiences of people can feel squashed and squeezed into urban life. Psychology itself can feel concentrated and magnified. The rich and powerful rub shoulders with the down and out. Sometimes this is brought into sharp relief: when I talk to Dr Daniel Masterson, who works as a consultant giving advice to local authorities on healthy urban planning, the Grenfell Tower disaster is fresh in his mind. These are challenging times for crystal ball gazers. Society has reached a strange impasse where technology has never been smarter and unimaginable advances are likely to be affecting us very soon, but where we also face enormous threats, politically and environmentally, which make the future difficult to see. Yet all the psychologists we spoke to vehemently agreed on two themes as vital in helping our cities of the future to flourish – health and inequality. They felt that psychology has an opportunity to place itself in the heart of cities, but that to do so psychologists must embrace their neighbours in other disciplines and use all available tools to build better, fairer urban areas. My journey into the heart of the city begins with Dr Hugo Spiers from University College London. We start off with bricks and mortar, but quickly veer off into psychology’s accepted place in a city. Writing for Scientific American Mind Dean of the Boston School of Public Health Sandro Galea described the increased health risks cities bring with them. Asthma, depression, cancer and overall rates of mortality have been linked to living in a city. In the 1930s sociologists Robert Faris and H. Warren Dunham documented a high concentration of schizophrenia and other mental health problems in the slums of Chicago, while a recent meta-analysis showed urban areas were associated with a 39 per cent greater risk of mood disorders and a 21 per cent greater risk of anxiety disorders. PTSD symptoms are also more commonly found in the city, with an astonishing 40 per cent of patients arriving at Chicago’s John H. Stroger Jr Hospital showing signs of the disorder. There are many theories about why cities seem to be so bad for mental health, with ‘social drift’ being favoured by some – the idea that those in distress may move to cities to find work or accommodation. Yet birth cohort studies in Scandinavia seem to suggest the ill effects of cities are dose-dependent – the more time we spend in cities as children, the more likely we are to experience mental illness. ‘People are also starting to think about things such as traffic, highways and pollution and the stress of inner-city living. Some have suggested that it’s got to do with the perceived resource of an environment, whether or not you believe you’re living in areas of deprivation or low quality,’ Corcoran tells me. Resources. ‘Beautiful’, ‘nice’ places. I don’t want to shatter the futuristic visions of clean, green, opulent city spaces, but are they realistic in these ‘austere times’? Dr Catherine Lido (University of Glasgow) has been working alongside the Urban Big Data Centre within the integrated Multimedia City Data (iMCD) project since it launched in 2013. The project has involved an in-depth household survey of 1500 people, capturing movements using GPS tracking, taking real-time recordings of people’s day-to-day lives in cities using wearable cameras, and capturing the holistic activity of Glasgow using social media posts about the city across a year. Her team’s survey measured demographics, attitudes, behaviours and knowledge in an attempt to capture how inequality emerges within education. In one of the first published studies from the data they found older adults struggle to continue learning, both formally and informally, if they felt unsafe or as if they didn’t belong in their urban communities. Amidst the uncertainty, and mountains to climb over equality and health, there is hope that cities will be places of unimaginable technological advance and positivity. As Edward Glaeser wrote in Scientific American Mind, cities can be places that foster creativity. More cities in a country means higher income overall; in our cities life expectancy is higher; and in New York City the death rate by vehicle accidents is 70 per cent lower than the USA as a whole. Yes, concentrated populations can result in group conflict and tension, but the American Psychological Association’s urban taskforce concluded in their report that cities also have the capacity to develop intercultural harmony and sensitivity. Psychology is at the crossroads, perfectly placed to promote health, equality and togetherness in order to make cities places of not just technological, but social advances. - Ella Rhodes is The Psychologist's journalist. She also asked several psychologists for their one way psychology could benefit the design of cities. Here's a selection of their responses. The problem with integrating nuggets of psychological wisdom into our design of a whole city is that even if we can make sense of the evidence and translate it into a design, it cannot easily be integrated into a comprehensive approach. Designs of many post-war housing estates have taken into account the needs of users at the time and often featured lots of green spaces, access to transport and shops. Although these estates were designed with the needs of ordinary people in mind, many of them are now considered model examples of how not to design modern housing. Where did it go wrong? Of course, there is not one simple reason. One factor might be the scale of these designs and the impossibility of one masterplan to accommodate the many different small-scale interactions and transactions inhabitants might need or want. Whatever the looks of the city of the future, we know people will thrive when they have the ability to make a living, when they belong to different groups and have stable relationships, when they can rely on being cared for when necessary, when they feel a sense of control over their environment and future and when they trust neighbours and local government to do the right thing. The challenge in designing cities of the future is in organising the conversation surrounding these questions, not just among psychologists but across disciplines, and especially involving residents and other institutions. The future city is not designed top-down by some all-knowing visionary but has scope for horizontal exchange and bottom-up influence. In order to achieve that, the process of building a thriving community becomes part and parcel of the design process itself. Our city centres are clogged with cars, so I expect we will see many changes to the modes of transport people use in them. But I think many people are overly optimistic about how fast the use of driverless cars will grow, and about the success they will have. They will have major benefits in terms of safety and mobility for our ageing society, but people will take time to adjust to the changes. We see that with Europeans sticking to manual gear-shift cars despite automatic cars being readily available. And with the introduction of ABS we expected to see fewer accidents but, actually, people felt safer so braked later and more accidents happened. It’s difficult to know how people will respond to new transport technologies. Driverless cars may also appear in cities last, given the complexity of the road systems and the number of pedestrians and cyclists. Lots of progress has been made, but we can’t afford machines to make an error here. With automated vehicles, it’s likely we’ll see fewer accidents, but when accidents do happen they’ll probably involve many more vehicles and get a lot of attention in the news (like plane crashes do). There is also likely to be an increase in the diversity of means of transport – we see it a lot in the Netherlands already with bicycles which can reach 45 km/h. We created the Urban Psyche assessment, where you can do a personality test on a city… we’ve carried these out in around 20 cities. It’s not perfect, but it leads to a different form of discussion about where the city can go. You can focus on healing the fractures that come out. Mannheim, in Germany, came out as having a lack of confidence… what do you do when a place lacks confidence? Arts programmes may be one thing. These assessments force you to get out of whatever silo you’re in and consider that the solution may be a combined one. So much about cities is calculated in an economic way, but human emotions are just so much more sophisticated. Our social and tribal natures bump into each other all the time. When we feel at ease, we’re more social and the city becomes more pleasant in general; when things feel like they’re moving too fast, people close in. Many of the things that make people feel psychologically good are to do with old-fashioned words like beauty. Confusing the priorities, not thinking there can be another way: those are barriers to psychologically healthy cities. We need to really understand the deeper motivations and feelings of the people living in a city and what makes life meaningful for them. You must link things about health and mental health with other aspects like jobs or the aesthetics of the place. Then embed characteristics of what makes you feel good about a place or project into designs of buildings. Cities should fulfil our ‘basic needs’, in terms of Maslow’s hierarchy – food, water and shelter. But that is not enough for the cities of the future. The built environment also needs to make us feel safe, connected, and inspired (to learn, be creative, play and be active). How can our cities be enhanced to optimise and fulfil these needs? First, architectural practices need to focus on building relationships with and between their users. For example, the Living Architecture Systems Group looks at how architecture can elicit qualities that come close to life – environments that can move, respond, learn, adapt and empathise with their inhabitants. As well as needing spaces that interact with their users, we need spaces that enable interactions between users. Helping people build connections with others is a major part of a healthy city. The built environment also needs to care for its inhabitants. The design of a building should focus on having the maximum impact on wellbeing, and this is particularly important in schools and hospitals, where things like the amount of nature and light available to people affects their healing and learning. Finally, we need to consider how the physical aspects of the built environment can affect us psychologically, so that we can optimise the design of a space to enhance needs such as perceptions of safety or inspiration and awe. This is where neuroscience comes in. For example, researchers in the built environment have begun to use skin conductivity or EEG data to understand the ‘emotional topographies’ of an area (Colin Ellard, Urban Realities Laboratory). Augmented and virtual reality can also be used to experiment with different designs or scenarios even before they are built. Understanding the psychological impact of a design on its potential users means that the design can be reworked and optimised to elicit a desired feeling or response. As new technologies develop and cities become smarter, the built environment is likely to become more emotionally in tune with its users. Although there is a lot of promise in this area, as with any psychological research, there are also ethical considerations to make sure this work is not causing harm to the city’s inhabitants. How can we ensure the psychological impact of a design is positive for all users? How can we make sure a place actually is safe and doesn’t just feel safe? As long as we take these sorts of questions into account, the incorporation of psychological methods in designing cities is likely to help make them healthier and happier places to live. Coastal zones are areas of deep concern when it comes to climate change; 60 per cent of the world’s population live in these areas, and 80 per cent of coastal populations live in cities. Of the world’s 19 largest cities, 14 are port cities. There are two primary threats to human wellbeing: slow-onset events (sea-level rise) and extreme weather events (hurricanes). EcoAmerica and the American Psychological Association have recently published two documents that illustrate the human impact of storm surges, sea-level rises, and more. These documents starkly demonstrate that climate change is already affecting communities. Areas in coastal Louisiana and islands in the Chesapeake Bay are losing land to erosion and rising seas. Recently, residents of the Isle de Jean Charles in Louisiana, which has lost 98 per cent of its land since 1955, became the first climate refugees in the United States. Currently, and in the future, coastal cities will need to address adaptation, resilience and risk preparedness from sea-level rise and extreme weather, not only for the physical infrastructure but also for the resident populations. The impacts on the individual of slow-onset events may include displacement, a sense of loss, helplessness, substance abuse and anxiety, while extreme weather events may lead to trauma, shock and strain on social relationships. The impact on community health may include loss of sense of belonging, increased violence and aggression, and social instability. Many of these outcomes are discussed in both the IPCC Group II Fifth Assessment and in the joint publications by ecoAmerica and the APA. The report Mental Health and Our Changing Climate states that psychology is well placed to address group process, community problem-solving, social cohesion and connectedness, a lack of trust between community members and institutions, differences in vulnerability, attitude–behaviour links, risk perception, and fear appeals. The report also argues that leaders in mental health have the opportunity to raise awareness of many of these issues. It suggests those in the field should remain up to date with climate-change news, run workshops on climate issues to inspire action in others, encourage and work with local community leaders to find solutions to climate-related issues, and support solutions by publicly sharing expertise to influence the media and policy makers. Environmental Design Research Association: www.edra.org. Glaeser, E. (2017). Triumph of the city: Engines of innovation. Scientific American Mind, March, pp.102–105. Lido, C. et al. (2016). Older learning engagement in the modern city. International Journal of Lifelong Education, 35(5), 490–508. United Nations Human Settlements Programme (UN-Habitat) (2016). Urbanization and development: Emerging futures. World Cities Report 2016. Nairobi: Author.